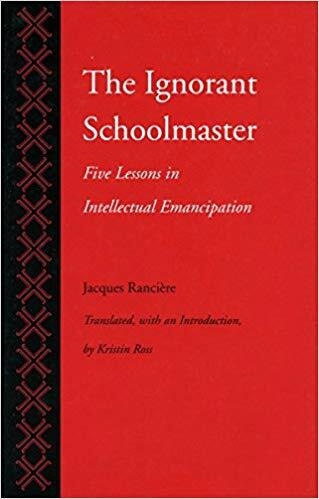 Rancière's classic book on education is committed to the idea of 'the equality of intelligence'. This book can be read on several levels. Primarily, it is the story of Joseph Jacotot, an exiles French schoolteacher who discovered in 1818 an unconventional teaching method that spread panic throughout the learned community of Europe. Knowing no Flemish, Jacotot found himself able to teach in French to Flemish students who knew no French; knowledge, Jacotot concluded, was not necessary to teach, nor explication necessary to learn. The results of this unusual experiment in pedagogy led him to announce that all people were equally intelligent. From this postulate, Jacotot devised a philosophy and a method for what he called "intellectual emancipation"―a method that would allow, for instance, illiterate parents to themselves teach their children how to read. The greater part of the book is devoted to a description and analysis of Jacotot's method, its premises, and (perhaps most important) its implications for understanding both the learning process and the emancipation that results when that most subtle of hierarchies, intelligence, is overturned. The book, as Kristin Ross argues in her introduction, has profound implications for the ongoing debate about education and class in France that has raged since the student riots of 1968, and it affords Rancière an opportunity (albeit indirectly) to attack the influential educational and sociological theories of Pierre Bourdieu (and others) that Rancière sees as perpetuating inequality.